I missed it by a few days, but my first edition Swords & Wizardry White Box print is dated January 22, 2009. Hard to believe it’s 10 years old already! It’s been one of my favorite, go-to RPGs since I got it and started playing with my kids that same year. These rules are designed to maintain the spirit and philosophy of the oldest gaming models, back in the days where the rules weren’t supposed to be ‘complete’ because half of the fun was making up your own rules to cover new situations. For me, a quintessential “lapsed gamer”, it was just what I needed to re-ignite my passion for old-school RPGs after many years away. I appreciated it as a rules framework, and became comfortable making rulings, rather than relying on rules for every situation. That first edition has a great legacy. It has spawned many supplements, derivatives, house-ruled versions and offshoots. So while it’s a shame that Matt Finch and team stopped supporting it, it certainly lives on and is still actively played in many forms. And White Box FMAG has taken over the mantle of a supported edition quite nicely. Here’s to another 10 years, thanks Matt and Marv! 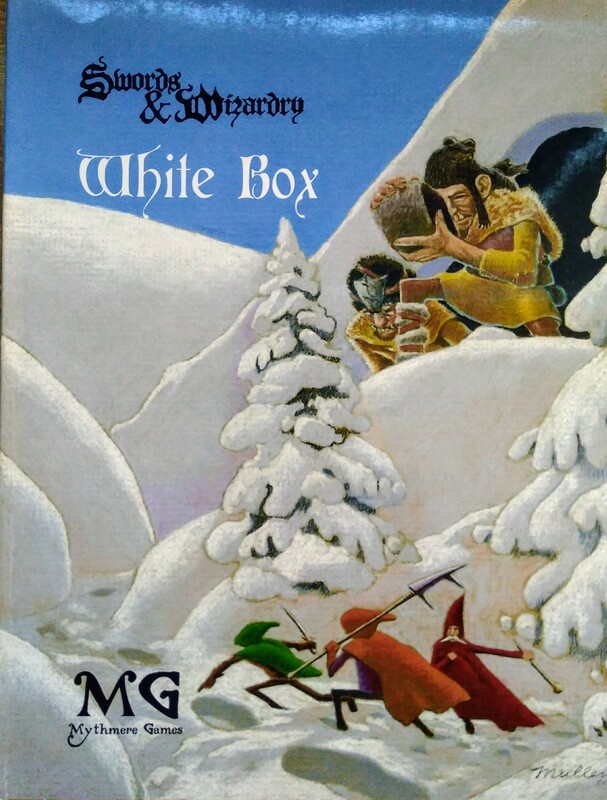 You can download a copy of the first edition of Swords & Wizardry White Box in doc or pdf formats from my forum. I looked back at one of my first blog postings and noted that on 11-22-09 my son and I played our first microlite 20 game. It marked my return to old school gaming. I also purchased a copy of the white box. The Mullen cover is so classic. Huzzah! Wow, we got back into gaming at just about the same time – do you still have those old blog posts online anywhere? Yes, I do. I will send you a link sometime.